I most commonly feature new artists I find on the site Noisetrade.com. The site itself is such a great resource to find new music and talented artists that are offering their music for free. I usually feature these artists in posts titled "What's Making Noise". But it seems like atleast once a month I find an artist on Noisetrade that warrants a more in depth review of the music they have mastered and freely release for fans to find. Today I am going to introduce some of you to Graham Colton. The Oklahoma City native has been writing and performing music for the past decade with increasing waves of success. 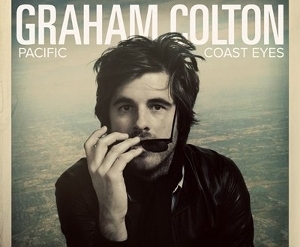 His latest release titled "Pacific Coast Eyes" is his first full album release since he began his solo career. A video was recently released for the title track of the album. Check it out below, it has a pretty humerous ending. Graham has once before offered his music on Noisetrade with his "Twenty Something" EP. I missed out on that release, but I didn't miss the opportunity to grab his newest album "Pacific Coast Eyes" on the site this week. Not only is the music offering fantastic, the production quality on the album is very high. It is rare that you find a full album released for free of this quality. Graham mentions on the site that this is his first independent album and it took everything he had to make it. Since it was released on Noisetrade, it has consistently been ranked among the top downloads on the site and the album is only going to be available for a limited time. Get to Noisetrade.com and download your copy now. It deserves to be heard. If you dig the songs and sounds, consider tipping the artist. You wouldn't hesitate to tip your waitress so make sure you show some love to a guy that's giving his living away for free. Thanks for your generosity Graham, great stuff! You can preview each song on the "Pacific Coast Eyes" album using the widget below. To get your free download, simply enter your email address and postal code and a download code will be sent to you.